The emails you choose to send your participants throughout the 360 review process can easily be edited in the administrative side of the tool. Follow the steps below to review EchoSpan's standard templates and make edits to adapt to your process. 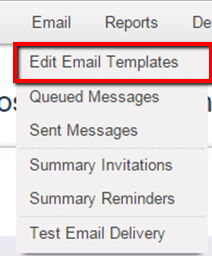 From the drop-down menu, select Email >> Edit Email Templates. Choose your recipient followed by the message you would like to edit. You can edit the wording of the template and/or copy and paste in your own content. You will notice that there are words in double brackets in each template, ex. [[targetname]]. 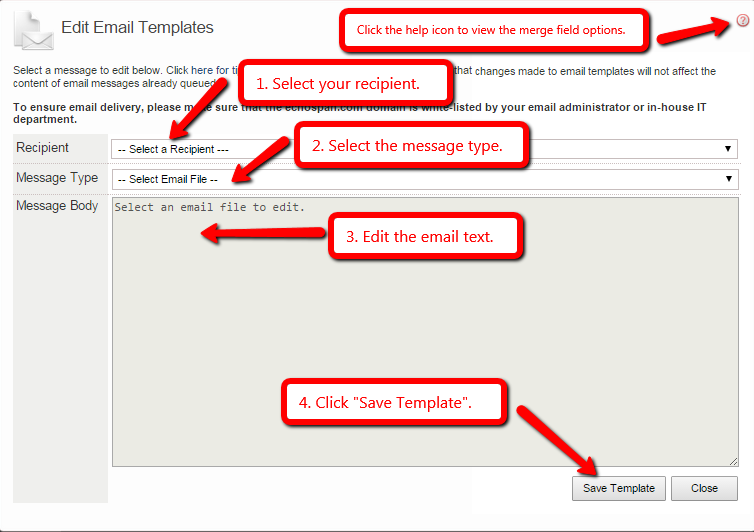 These are merge fields that are going to automatically customize each participant email. If you would like to include more custom fields, a list of them can be found by clicking on the red question mark in the top right corner of the email editing section. Once Targets and Raters are added to your project an email will be queued for them (by default) using the templates in the system at that time. If you make changes to the templates after the participants are added the system will prompt you to re-queue your messages using the new language.